"Attached are photos of my 1965 Corvette body that you repaired and painted. The before and after pictures are dramatic. I am very satisfied with the work that you did for me. I have campaigned my car and obtained a Regional Top Flight award, and your paint work was very favorably accepted by the judges. I'm very happy with it." "I want to personally thanks Mark Gordon and his Team at Mark's Fiberglass for helping me finish my 1966 Corvette Coupe. My car had been disassembled for over 20 years and was stalled because I could not find a shop I entrusted to do the work at a fair cost. Mark came out and gave me an estimate, and a targeted completion date. The price was reasonable and I had seen a couple of examples of his work. I decided to let him be the "shop of choice" for my pride. The finished result was exactly what I wanted. Mark communicated regularly with any questions or concerns to make sure he knew exactly what I wanted in the finished car. The final result was judged at the NCRS Kansas City Judging event in May, 2010. The car scored a 'Top Flight' award and the paint job was the 'eyecatcher'. The car has been driven and shown at several local events during the past Summer, and many folks commented on the 'WOW' paint job it had. They wanted to know who did the work, which I proudly told them Mark's Fiberglass in Merriam, KS." "Here's a shot of the car you requested. As you know, you've done body/paint work on all these (plus a couple of late models). I've always felt you treat me fairly, do quality work, and offer quick turn around. I've recommended you to several other folks who have been happy with your work and I'm sure I'll have some other cars that need your touch in the future." 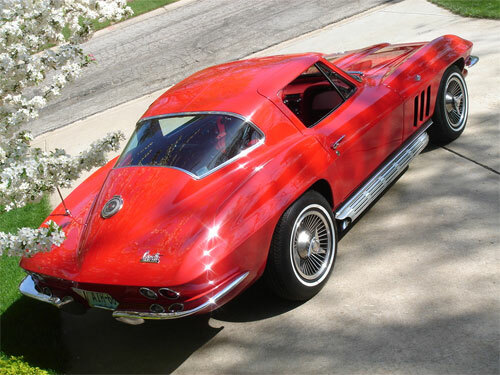 "Having been in the Corvette Restoration business for 20 years, I feel qualified to give an opinion as to the abilities of Mark Gordon (Mark's Fiberglass) to accomplish ANY automotive paint & Body work. Whether it's metal or fiberglass work, the job is always done to our ratification, Or he ask you to return it until both parties achieve the desired results! 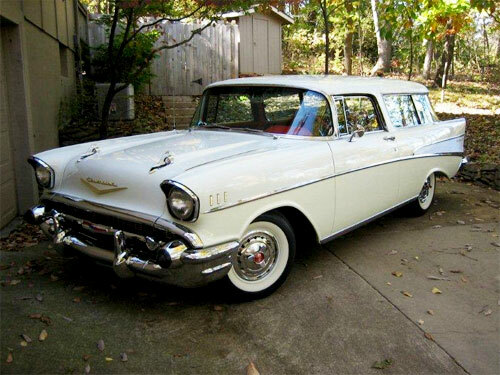 "As the owner of Vintage Vettes LLC --- we have consigned in excess of 50 Corvettes and classic cars to Mark for partial or total paint and body work over the past 5 years. Most enjoyable part is the fact Mark is able to work within our budget restraints of each individual project. When the budget is large: High grade NCRS Style paint and Body work is demanded --- HE CAN DO IT. and there are times with the value of the finished project just doesn't allow for expensive prep work and time consuming "Blocking" of the Corvette bodies. He understands this and will only invest the time needed to produce a "Still quality Job!" Guess you would say: We are confident when we drop off a job it will be done to a high standard, and within the agreed time frame! Would recommend his shop to anyone who would ask: 'Where should I have this fixed?' Go see Mark in Merriam, KS."